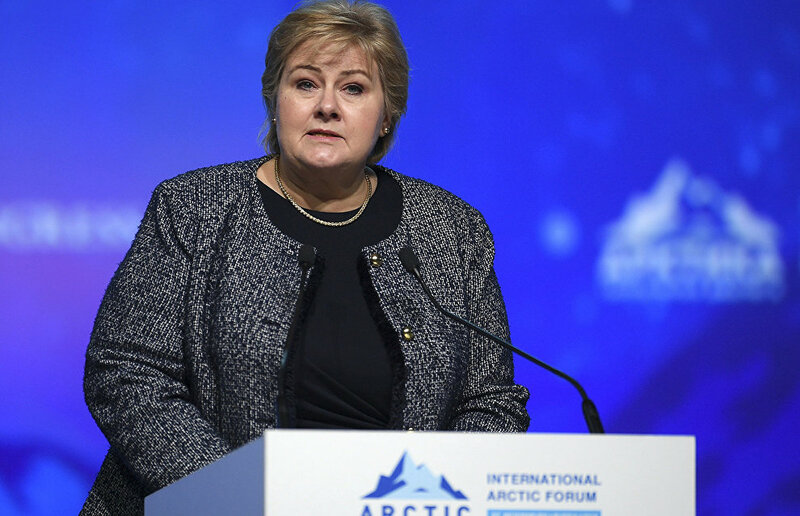 Norway will work to make the Barents Sea region safer, said Norwegian Prime Minister Erna Solberg. "In October, Norway will assume the chairmanship of the Barents Euro-Arctic Council, and we will work for a stronger and resilient Barents region with particular focus on health and people-to-people contacts and knowledge," she said, speaking at the plenary session of The Arctic: Territory of Dialogue 5th International Arctic Forum. Solberg noted that "the ocean is at the heart of most Norwegians." "Healthy oceans are a prerequisite for achieving the Sustainable Development Goals," the prime minister continued. "Ecosystem-based ocean management and cooperation between coastal states, and the management of trans-boundary marine resources are important factors. And as maritime nations, the Arctic states have a special responsibility to take action to ensure healthy and productive oceans." Solberg emphasized that Russia and Norway have been cooperating in the field of marine science for 60 years and have managed to protect the environment while ensuring the sustainable development of fisheries in the region. She added that other countries should follow this example of bilateral cooperation.